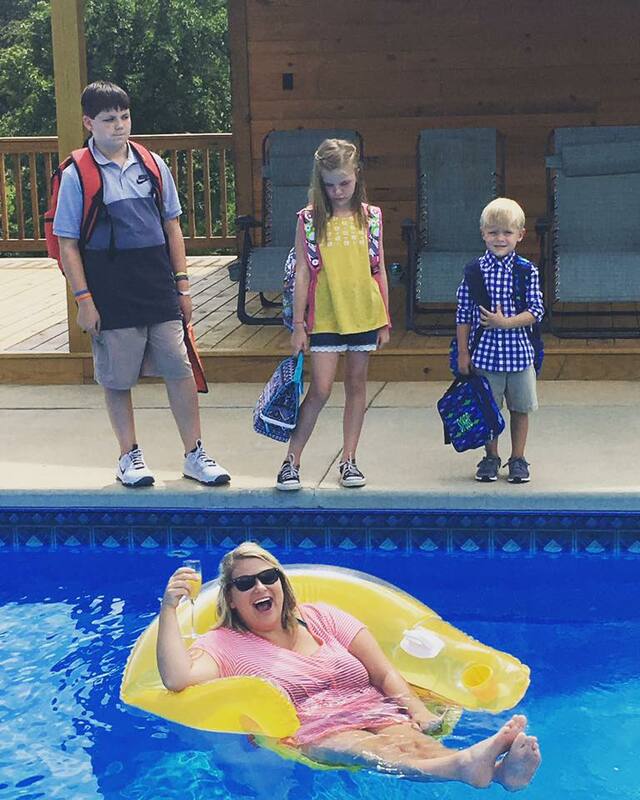 Alabama mom Jena Willinghamm may have been onto something when she posted the now-viral photo of herself in a pool—cocktail in hand—while her three children stood behind her looking sad to be going back to school. As much as we love kids, keeping them occupied when they are out of school and not in camps or programs no short order. But each fall often blows in with new items for your to-do list. Out go summer Fridays and lax bedtimes and in come soccer Saturdays and hectic mornings. You may be surprised to learn that almost half of Americans say fall is the best time to get organized, according to a survey by SpareFoot. In fact, 45 percent of those surveyed said that fall months are organizing prime time. It makes sense when you think of it since at the same time students return to class many businesses are kicking into high gear after a summer slowdown says Amy Esper, professional organizer, move manager and co-head of In Order to Succeed in Sarasota, FL. Amy, the mother of three small children (all under the age of 4) considers fall to be the beginning of her family year since that is the time that that all the new routines kick in for her children as they enter their new classes and programs. These six tips will help you get back into your groove and stay productive to have your most organized fall yet. No person can keep a whole household organized by themselves; it’s just not realistic. Get your family involved in the organization process. Establish new fall routines with their input. If anything is being reorganized or repositioned, walk your family through where items should go so they can help put things away. Labels are crucial to make sure family members knows where things need to be put away. Use post-it notes until you have a chance to affix permanent labels. We love this portable Epson label printer – it even connects to a laptop for even greater productivity. Hold the keys to a more organized life in the palm of your hand. The app store is full of downloads that help users stay on point. Three (free!) favorites: Todoist allows you to manage tasks and projects anywhere. At home, at school, at work . . .both online and offline and across 10+ platforms. Remember the Milk is another similar type of app that can help you get more done in less time. This powerful app allows users to create and prioritize to-do lists by due date, tag or importance. It syncs to Google Calendar, Gmail and other devices and lets users create groups and assign tasks. Running late? Ask your spouse to hit the grocery store and your teen to set the table. 30/30 launched on the premise that most tasks like checking e-mail and making lunches only take 5 to 30 minutes per day. Map out your day, set a timer and let the app say when it’s time to move on. Your kid may have had summer assignments but the school year brings regular homework with shorter deadlines. To help your child stay on track, create a clean, well-lit and distraction-free space for homework. Short on space? Get our tips on creating a home office out of a spare room. Stock it with pencils, pens, rulers and paper. If your kid is a habitual screen-checker, consider not allowing devices in the room unless it’s required for the assignment. Here are five inspiring work spaces you can create in your home. A stress-free morning starts with a good night’s sleep. WebMD provides good guidelines for age-appropriate bedtimes. If your child is having trouble getting back to a regular bedtime, try gradually scaling back the bedtime 30 to 60 minutes every few days until s/he is hitting the hay at an optimal time. As for you, the National Sleep Foundation suggests adults ages 25-64 get 7-9 hours of sleep per night. The optimal time will vary from person to person, but researchers from Sleep and Neuroimaging Lab at the University of California, Berkeley say that REM sleep cycles, the light phase of sleep just before which repairs the mind, typically begins after midnight regardless of when a person goes to bed. To ensure the body gets all the REM and non-REM sleep it needs, try to get find a bedtime between 8 p.m. and midnight. Experiment with a few different times and stick to the one that works best for you. With everything in its place, waking up and getting out the door should be easy… right? Unfortunately not according to most American parents. When the school year starts, 80 percent of parents feel it takes them longer to get ready in the morning than during the summer. And, nearly one in three feel it takes more than 20 minutes longer. When you have kids, back to school routines can make mornings stressful, making organization key to create more productive mornings. As cute as a morning fashion show is, figuring out what you and your kids are going to wear the day before can save precious minutes each morning. Make breakfast and prepare lunches the night before, whenever possible. Throwing together breakfast on the go and organizing lunches for the whole family can make a busy morning even more overwhelming. You may want to go the extra mile by helping your children neatly pack backpacks check assignment lists with them to ensure nothing is missing before bed. Vacation may be over, but don’t let leisure get lost in the shuffle of soccer practices and meetings. Book a massage, hit a favorite restaurant or just take five minutes a day to look at your favorite photos. Taking time for a breather can get your ready to tackle the next task (and, according to researchers, lowers depression). Keeping a summer mindset as long as possible is always something worth striving toward.